I fish man-made freshwater canals in Cape Coral, Florida that are about 50-60 years old now. Not that old at all, but there is an abundance of whopper sized everything - from Largemouth Bass to Alligator Gar to Oscars to 5 foot long Grass Carp. But I really enjoy the awesome Red Ear Sunfish fishing. I catch all sorts from BlueGill, Red Ear Sunfish, Green Sunfish, Flier, Warmouth, Mayan Cichlid, Oscar Cichlid, Midas Cichlid, Jaguar Cichlid. All within a one block area. Here is a Red Ear Sunfish I caught one morning before work on a 1/64th ounce ultralight jig, bright yellow super small curly grub, tipped with a red wiggler. I caught it just on the edge of a submerged bush from high water. Almost lost it in the bush because my line is 2 pound test, and so it can't handle heavy brush/weed fishing. I used a 4' ultralight rod matched with an ultralight reel and 2 lb Stren fishing line. I actually had eaten this fish for lunch that day at work. It weighed an even 1 pound and a half, an even 24 ounces on my digital scale at work. Very tasty, Mmmmmm. There is many more where this guy came from. Also lost a picture of a 19" Mayan Cichlid which was unknowingly a world record. The world record is 13" for that fish species. 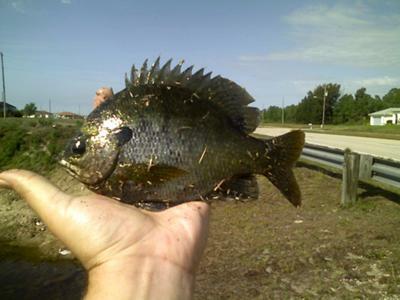 The world record Red Ear Sunfish is 4 and a half pounds. Which I unknowingly beat as well with a 5 lb even Red Ear Sunfish. Both of those fish were released in 2009. I caught them on red wigglers and a size 10 Mustad live bait hook and split shot rig. Join in and write your own page! It's easy to do. How? Simply click here to return to Bluegill Pictures.